Do you wish to adopt an animal? Most of the dogs are available for adoption, but we regularly have urgent cases needing their own family. If you are interested, please contact us. Some dogs need homes more urgently because they are extremely human-focused and the need for human contact cannot be fulfilled due to the large number of dogs. Others are simply not made for living in large packs. They are mobbed, bored and get up to mischief, being under-challenged. Thai dogs are extremely easy going and adaptable, according to reports from all adopters and also Elfe. Should you be interested in a dog, please write to us! 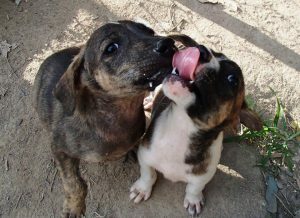 In addition to the urgent cases many other dogs are available for adoption! All dogs are completely vaccinated (rabies, distemper), castrated and healthy. Some tests cannot be performed locally, there are only so-called quick tests (blood parasites) which are not 100% reliable. A PCR test is not possible. The dogs are health-checked before departure and quick tests are performed only in suspicious cases (physical symptoms). Babesia cannot be tested locally. If you are interested in a dog and to receive further information, please contact us. You can find detailed information on adoptions and the individual dogs in our Facebook Page. Here we show dogs who urgently need a home of their own as they are very much attached to humans, cannot handle big packs, get bored or are bullied by others.. They have to be confined to themselves most of time for their safety.. In this album we show you the dogs ready to travel to EU.